new year, new boots! gorgeous thick leather, lined in shearling in the shaft, very little breaking in required. easily one of the best shoe purchases i've made all year. did you get yourself anything from the year-end sales? oooh, lovely. I bought myself a ring before Xmas - vintage mid-century Scandinavian piece. But I haven't been out of this house since Dec. 23, except for NYE, if you can believe it. Nice! Golden Goose boots are pretty amazing. I like that they're lined with shearling...so cozy! I ended up getting a pair of Margiela pony hair stilettos. I know, stilettos, what?! But I think that every girl needs a pair of super hot going out shoes. I hope you had/are having a great time with your BF! Oh yes!! I'm so glad you snagged these, they are totally awesome and I do think they will be quite versatile despite their rough and tough exterior. Nice pick! How is Shanghai treating you? Golden Goose boots are the best, so walkable, and just so perfect. I just ordered another pair of Theyskens' theory flats in black suede in anticipation of heavy rotation of the black pair I got from Gilt. love. @K.Line oooh. vintage is always so nice to treat yourself to - hope you've been staying nice and cozy! @Prêt à Porter P yep yep :) ooh which boots did you get from the LG sale? looking forward to your posts of your sale finds! @chic_e your new blazer sounds amazing! the GG bikers are great. they kind of negate the need for any other kind of shoe from now until late spring! The ld tuttle shapers (flat thigh high boot), they're included in my 2011 recap. I love the sound of the shearling lining, congrats on scoring them on sale. I am lusting a shirt online but I'm just terribly unwilling to buy something over the internet without trying, especially when I haven't tried much from the brand. Also, it seems terribly wrong to buy another blue and white striped shirt. Great boots - maybe you won't miss the Margielas as much now? I got some good basics on sale. You will wear these boots forever - until they fall apart. 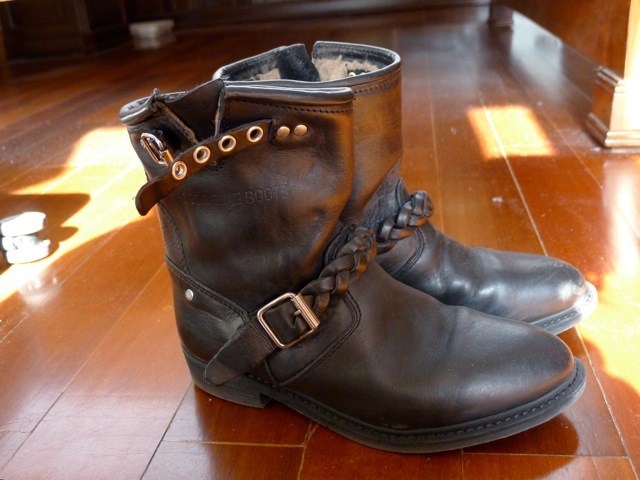 If I could go back in time to purchase a second pair of the biker boots I have I would. The leather on the inside of the heel is wearing through and it makes me sad ... but at least I got years and years of solid wear out of them which is a good thing! I have been really good with the post xmas sales, only ended up buying a few things from NAP the other night and a samsonite suitcase for my trip to the US (which I need... My first suitcase! ).